DigDates co-founders, sisters Casey and Leigh Isaacson, pose with Casey's 4-year-old King Charles spaniel-poodle mix, Layla. Visitors mix and mingle at Deja Vieux food truck park during an event sponsored by Dig. You look at your phone, and there’s a picture of Megan and her wrinkly bulldog — underbite protruding. Ray scooping up his beagle. Nicole cuddling her shar pei. Denise doting on her poodle, which she happens to carry in her pocketbook. You’re not looking at an advertisement for the SPCA. Rather, you’re on one of the newest additions to a growing pool of dating apps, designed to help you find love (or — depending on the app — some briefer stand-in for love). “There’s a disconnect between what people want from most dating apps, and what dating apps provide,” explained Leigh Isaacson, the 30-year-old co-founder and CEO of DigDates, a free dating app for dog lovers and dog owners. Or, as the app puts it, "When you’re dating and you’re a dog person, nothing matters more than finding someone who fits into your dog-forward lifestyle." In the year since the app launched, Dig has attracted 30,000 users. And, while there are users across the country, the app wasn’t founded in some far-off tech haven like San Francisco. Isaacson founded it with her sister in New Orleans. “So, it all started back in 2016,” Isaacson recalled. The advantage of dating apps is that it allows users to connect with potential partners outside of their social circles. The disadvantages — depending whom you ask — are many. Isaacson found users are on as many as three or four apps at a time, spending as much as 10 hours swiping each week. Not surprisingly, they don’t often find that to be time well-spent. Dig aims to mitigate that frustration by slowing things down. When you log onto the app, potential matches are presented in groups of five, and you can decide whether you “Dig” them, “Really Dig” them, or want to pass on them. There are also a lot more dog pictures than your average dating app, which is more fun to look through than, for example, the dating app-stereotype of a shirtless man hoisting the large, dead fish he caught. But there are other ways Dig differs from most dating apps as well. Dig suggests dog-friendly date locations near you and was described by the women-focused digital media company Refinery29 as “one of the most wholesome dating apps out there.” Users are 70 percent female (which might make it the only place in modern dating where the odds favor men finding a match), and generates revenue with dog-related advertising for local sitters, walkers, and doggy costume shops. Dig also hosts live events. In an event last year, the Isaacson sisters successfully pitched the National Day Calendar to add National Dog Mom’s Day as a holiday (sharing a day with other holidays such as “National Foam Rolling Day”). 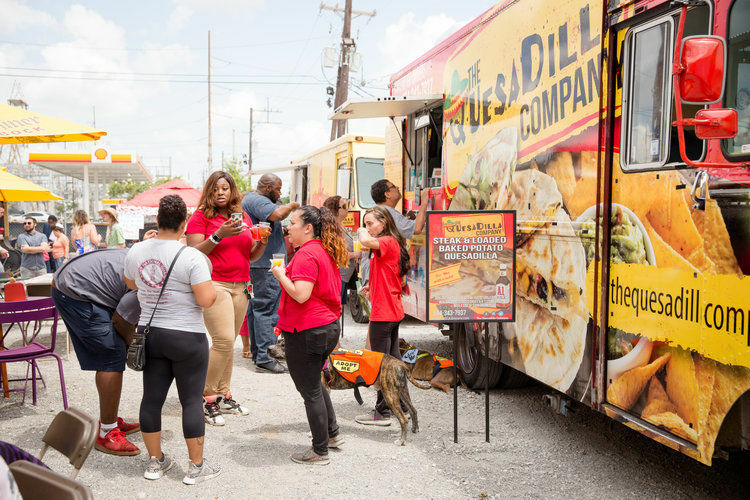 Hundreds of Dig users and their pets came out to the (dog-friendly) Deja Vieux food truck park on Tchoupitoulas Street to celebrate the day. Dig hired a chief technology officer, Charles Feinn, who moved to New Orleans from the Bay Area back in 2014 — the app's first full-time employee outside of the Isaacson sisters — and all dogs featured in their marketing material or on social media are up for adoption at New Orleans-area animal shelters. And, when she takes her idea to other cities, Isaacson says, people love that Dig is not just another Silicon Valley startup. “New Orleans has a reputation for throwing a good party, and I think that’s something Dig is pretty good at,” she said. And Leigh and her team believe that can only help more people find the romance they’re looking for. “I think Dig provides a dating situation with less pressure,” she said. “You have dogs right there with you to talk about. Someone’s going to have to pick up dog poop. Or you’re going to find a little hair in your food, and — because you both love dogs — you’re going to laugh, and you’ll let your walls down a little bit. At least that’s the hope. WRITER MATT HAINES LIVES IN NEW ORLEANS. FOLLOW HIM AT MATTHAINESWRITES.COM.